Every aspect of Jenny and Colin​’s wedding day left a smile on my face. It was truly magical to watch the day move along. It was almost as if there was a special romance lingering in the air, pulling us through the day. ​Jenny ​donned her gown in one of the suites at the mansion where they would celebrate later in the night. The natural light poured into the room. Jenny’s mom helped her into her beautiful custom gown. When I say custom, I mean Jenny’s gown was made from the lace of three other wedding gowns – all from her relatives. The lace around her neck and​ top of the dress came from her mother’s gown. The lace on her sleeves and veil came from her paternal grandmother’s gown. The lace at the bottom of the gown is from her maternal grandmother’s gown. For some extra fun, her garter was made from the lace of Colin’s mom’s gown. The bridesmaids wore mismatched blush dresses in the same beautiful shade​. They all carried beautiful, lush, organic bouquets flowing with greenery and Juliette garden roses. The ceremony took place right in the center of Franklin at St. Philip Catholic Church, where Jenny’s uncle performed the ceremony. It was so touching because he was able to add so many personal details about the two of them to the holy celebration. ​Jenny & Colin’s wedding was timeless and classic with a gorgeous, neutral color scheme. 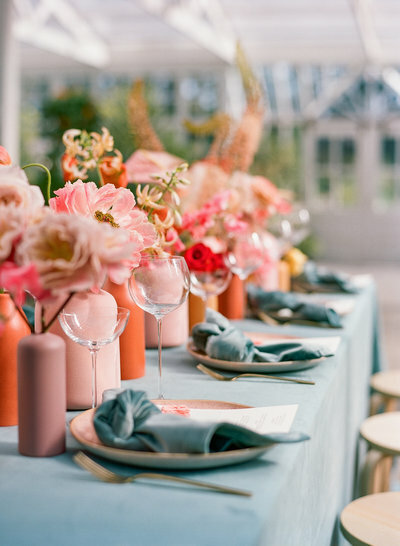 Pops of blush and greenery added interest and an organic feel to their decor. ​Twinkle lights draped over the guests as they enjoyed their meal. To top it off, they had a dessert table fit for a king and queen. Guests mingled around the grounds of the Ravenswood Mansion, playing corn hole and listening to the live band. Jenny and Colin had the most perfect wedding day, surrounded by family and friends to celebrate this new stage in their lives together.